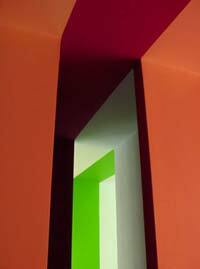 Rodney LaTourelle’s latest exhibition, an immersive, site specific installation titled, In the Absence of Unambiguous Criteria (2007), takes the viewer through a maze-like construction of three interlinked, striped corridors, each containing a small one-person cell of saturated colour. LaTourelle sets up a participatory mise-en-scène for people to actively navigate his matriuschka-like spaces of colour fields, transforming the typical disembodied aesthetic space of the gallery into a field of direct experience. One cannot simply gaze at a safe, intellectual distance, but must wander and slip through his sometimes narrow passageways enveloped in varying, rhythmic colour worlds. Three corridors, each with their own distinct colour theme and extending across the room from the street level windows of Program’s project space, create a juxtaposition of natural and artificial light. The colours oscillate between the reduced extremes of natural landscapes—the bright purple and light yellow of the sunset; the apple green and light blue of the lily pond, and the cold silver and white scheme of the arctic—to set up a total environment of chromatic relationships nestled somewhere between Goethean logic and the tones related to the body’s chakra system. Exploring the interactive experience of the kinetic body, the installation could be described as a haptic surface, or rather a surface exploded into a three dimensional envelope. Through pure visceral intensity, the work becomes a space of proposition, inviting the participant to perform within and throughout its nested volumes. The hybrid universe proposed by LaTourelle—between architecture and abstract painting—diffuses the formal elements of both traditions, and in so doing, collapses the conventional distinctions between inside and outside, figure and ground. As you slip through the narrow entrance, past the unfinished, raw exterior of the structure, you are immersed into a kind of trompe d’oeil cosmos where surfaces take on volumetric proportions; appearing as undulating three-dimensional stripes. The flood of bright white light emanating from small adjacent cell-like rooms, act as energy incubators, with concentrated variations of high gloss pinkish-magenta creating orgasmic centers of meditation—a place to literally re-charge oneself in the midst of modulated coloured light. The slender passageways which zigzag between corridors blend in with the rhythm of the stripes, maintaining an illusion: that of the continuity of a closed form. It is an effect rendered visible only through movement—of one’s own body or through the surprise penetration of the “surface” by another person in the space. Illusion on the corporeal scale, here, creates an atmosphere of child-like discovery on the part of the audience, playfully intervening in, and transforming the Modernist desire to project painting into space. By activating visitors to the exhibition in a direct, kinetic fashion LaTourelle, draws upon the ethical tradition of the Brazilian Neoconcretists for whom meaning was found in viewer participation and not in an artworks’ visual form. Through experiments with the liberation of painting from the frame, the Neoconcretists established an aesthetic of embodiment. By creating a sense of wonder that precedes the scientific determination of form, time, colour and space, they fostered elemental encounters with objects in the world1. In the Absence of Unambiguous Criteria furthers this aesthetic of embodiment by establishing an ephemeral and shifting sense of an interwoven landscape that is combined with unexpected colour associations in order to establish spatial transitions and pulsating rhythms of reflection. Provoking connections between the mind/body and space/time of pure sensation, the liminal nature of the work liberates the spectator beyond representation. Seeming dualities find a space to re-fold themselves into a complex amalgam of experiential encounter. Raw and unfinished, the visible presence of the orthogonal structure within the gallery creates a contrast between the exterior surface and support and the sensual and luminous landscapes of the interior space(s). The perfect geometrical spacing and precision of the two-toned painted worlds are notable in our wholly imprecise, non-repeatable, fleeting experience of them and the atmospheres they evoke. The modulation of space enacted by the installation allows us to cultivate our own rather anthroposophic-like apprehension of the space(s) —we can tune out our spatial expectations and conscientiously delve into primordial intuition, opening up a new awareness of our relationship to our surroundings, but perhaps more importantly to our own emotional logic. LaTourelle manages to whimsically untie us, for a moment, from our reductive, analytical ways through a spatial/ perceptual estrangement of the senses. In reviving the rather forgotten connection of early European abstract artists to esoteric thought, In the Absence of Unambiguous Criteria stages for us, the performers, a kind of return of colour as culture to the body. In so doing the work instigates a line of questioning concerning the current implications of this cultural legacy vis-à-vis the perceptions of the body and its capacity for enactment and reception. How can one be receptive with the body, and how are such receptions learned through the body? It is said that Annie Besant, a late 19th Century mystic and member of the Theosophical Society, could see coloured shapes radiating from the body—for her colour was connected to our interior, to the billions of atoms that comprise us, intrinsic and expressive of our corporeal/ethereal selves. LaTourelle’s installation harnesses these unknown and perhaps unknowable qualities of the lived, and extends this possibility outwards. His gesture seeks to free us from preconceived perceptions, where our forgotten, stolen colours have been returned and released back to us.